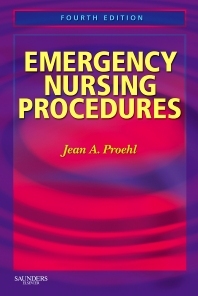 Written by expert emergency nurses across the country, EMERGENCY NURSING PROCEDURES, 4th Edition includes 193 step-by-step emergency procedures, including four new procedures — umbilical vessel cannulation, pelvic splinting, peripheral nerve stimulator (twitch monitoring), and methotrexate for ectopic pregnancy. Detailed illustrations visually reinforce techniques and clearly show steps to procedures — making this handbook an essential and comprehensive resource for any emergency professional. Includes pediatric and geriatric information, with procedures when appropriate, to help you treat these specialized patient populations. Consistent format and handy, portable size make this handbook ideal for everyday quick reference. Emphasis on research-based practice helps you provide the best care possible according to the latest evidence. Focused on the most essential, practical information, this handbook provides all the information you’ll need on a day-to-day basis.